Alcohol acts as a general depressant of the central nervous system. It “depresses” or inhibits the function of neurons by reducing their ability to transmit or “fire” electrical impulses. These electrical impulses carry information that is essential for normal brain function. The overall “inhibitory” effect of alcohol on the brain is very similar to that produced by other drugs that cause sedation and anesthesia. Neurons communicate with each other through the transmission of electrical and chemical signals. Because electrical impulses can’t jump from one neuron to the next, electrical impulses are converted to chemical signals. The conversion of electrical to chemical signals occurs at the synapse, the connection between two neurons. The chemicals are called neurotransmitters —they diffuse across the synaptic space between neurons, and bind to specific proteins or receptors on the receiving neuron. This binding reaction triggers a new electrical impulse in the receiving cell, and the communication proceeds so that the brain can function normally. Alcohol inhibits the generation of the new electrical impulse. Figure 2.4 A synapse is the connection between two neurons; it is where all the communication takes place. 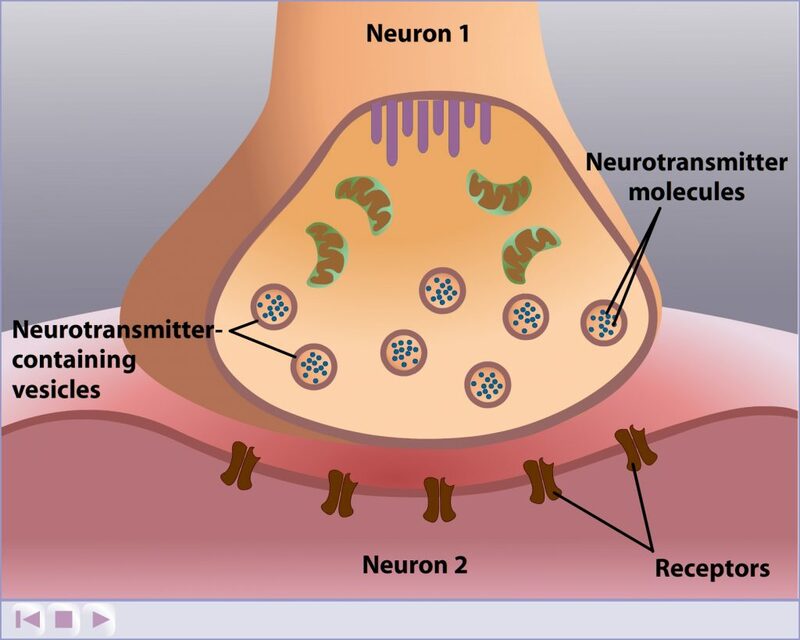 Neurotransmitters released from neurons bind to receptors on the receiving neuron. This changes the electrical activity of the receiving cell. Alcohol and other drugs that affect the brain act at specific synapses. The synapse is the site where information is exchanged between two neurons. Alcohol alters neuronal function by disrupting communication at the synapse.